When you hear lot of roar, continuous claps, cheers all around the stadium and witness someone who is having a long and aggressive run up that reflects an express bowler is on his way to send another lethal delivery to the player who has fully protected him with different equipments. It is always great fun to watch the fast bowler at his best especially in a Test match as he does not have a limited quota of overs as compared to the limited overs cricket. Only the brave batsmen can face them, there is no room for the timid ones and the careers of quite a few men with the wooden blade has come to an end well before they have imagined. We will highlight 10 most successful speed merchants who have sprinkled their art in the game and added lot of thrill by their excellent skills with the ball. 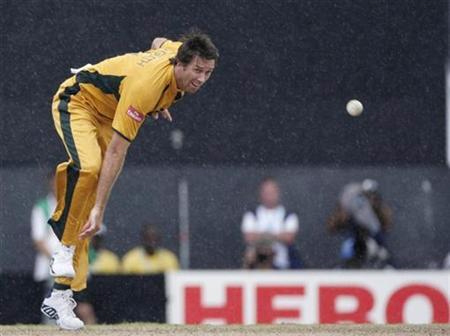 Glenn Donald McGrath was born on February 9, 1970, in Dubbo, New South Wales, a right arm medium fast bowler and right hand batsman. He was one of the finest bowler ever produced by Australia and created history for the nation after surpassing great Dennis Lillee who held 355 wickets earlier. He was a match winner and knew how to get rid of best batsmen of his time and used to deceive them with his line and length rather than speed. The right arm bowler made his debut against New Zealand on November 12, 1993, at Perth and claimed three wickets in the match. The 41-year-old has played 124 Tests, grabbed 563 wickets at an excellent average of 21.64 runs per wicket, the best of 8 for 24 runs in an innings and 10 for 27 in a match. 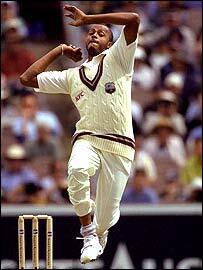 Courtney Andrew Walsh was born on October 30, 1962, in Kingston, Jamaica, a right arm fast bowler and right hand batsman. 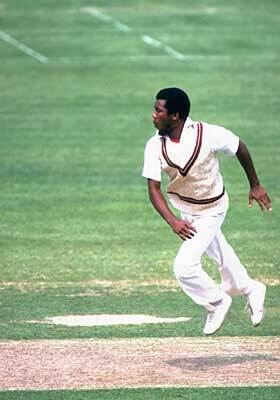 He was a lanky pacer who matured under the wings of great Windies speed merchants, Malcolm Marshall and Curtly Ambrose. He had lot of stamina, never felt tired even after long spells and ruled the cricketing world with his accuracy. He played his first match against Australia on November 9, 1984, at Perth, but could not get a chance to bowl as just three bowlers dominated the proceedings and the Caribbeans won the match by an innings and 112 runs. The 49-year-old has played 132 matches, gathered 519 wickets at a perfect average of 24.44, the best of 7 for 37 in an innings and 13 for 55 in a match. 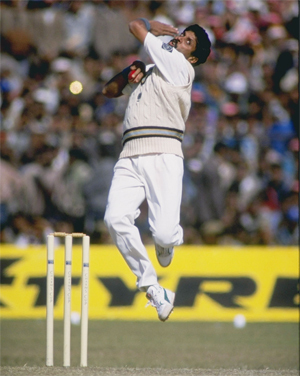 Kapil Dev Ramlal Nikhanj was born on January 6, 1959, in Chandigarh, a right arm medium fast bowler and right hand batsman. He was one of the finest all rounders of his time, a successful Captain of India who always led the team from the front by his individual performance and won the 1983 World Cup for his country. He is the highest wicket taker in the fast bowling department for his country and was declared ‘India’s Cricketer of the Century’. He entered in international cricket playing against Pakistan on October 16, 1978, at Faislabad and took one wicket in the match. The 52-year-old has participated in 131 matches, held 434 wickets averaging 29.64 with the best of 9 for 83 in an innings and 11 for 146 in a match. 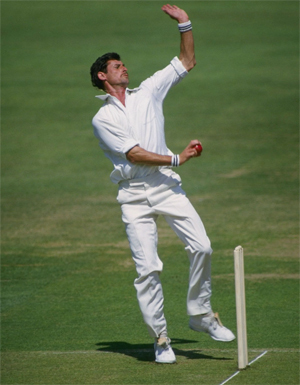 Richard John Hadlee was born on July 3, 1951, in Albans, Christchurch, Canterbury, a right arm fast bowler and left hand batsman. He took the Kiwi’s to the heights of cricket by his all round performance and was regarded as a deadly bowler of his time. He was the first bowler in the history of game to achieve 400 wickets and made his presence felt in every match he played. The 60 – year old made his debut against Pakistan on February 2, 1973, at Wellington and claimed two wickets in the drawn Test. He has played 86 matches, clinched 431 wickets at a decent average of 22.29 runs per wicket, the best of 9 for 52 in an innings and 15 for 123 in a match. 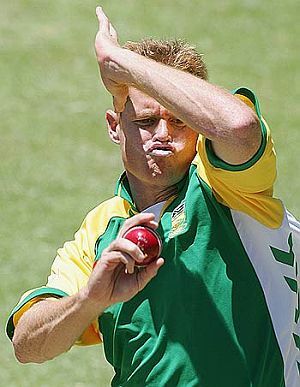 Shaun Maclean Pollock was born on July 16, 1973, in Port Elizabeth, Cape Province, a right arm medium fast bowler and right hand batsman. He was influenced by his father Peter Pollock who was also a fast bowler and represented South Africa in 28 Tests and held 116 wickets. He was an intelligent fast bowler who shared the responsibility of new ball with another great quickie of the Proteas, Allan Donald, and the duo brought numerous victories to their homeland. He was good with the bat as well and had the honour to lead the national side as well. Pollock made his debut against England at Centurion Park, on November 16, 1995, and claimed three wickets in the only innings of the visitors as the match was restricted to two days due weather. The 38-year old took part in 108 games, held 421 wickets at a supreme average of 23.11, the best of 7 for 87 in an innings and 10 for 147 in a match. Wasim Akram was born on June 3, 1966, in Lahore, a left arm fast bowler and left hand batsman. He was one of the best left arm bowler in the history of the game who has the ability to produce six different balls in the over. The left armer was competent enough to swing the ball either way and carried lethal Yorkers in his armoury. He was an excellent all rounder and played many vital innings for Pakistan. He also had the opportunity to lead the national squad and was the proud member of the 1992 World Cup winning team of Pakistan. The 45-year- old started his career against New Zealand on January 25, 1985, at Auckland and held two wickets. Wasim Akram played 104 Tests and accumulated 414 wickets at an awesome average of 23.62 runs per wicket, the best of 7 for 119 in an innings and 11 for 110 runs in a match. 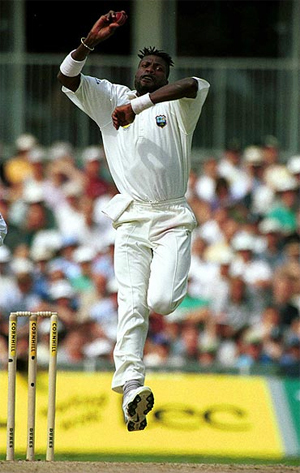 Curtly Elconn Lynwall Ambrose was born on September 21, 1963, in Swetes Village, Antigua, a right arm fast bowler and left hand batsman. He was a tall and lanky bowler with the desperation to get the wickets even on the dull surfaces. The right arm bowler never believed in compromise but instead attacked the rival batting by his dangerous deliveries. Ambrose appeared on the international scene against Pakistan on April 2, 1988, at Guyana and claimed two wickets in the match. The 48-year-old has taken part in 98 matches, held 405 wickets at a fabulous average of 20.99 with the best of 8 for 45 runs in an innings and 11 for 84 in a match. 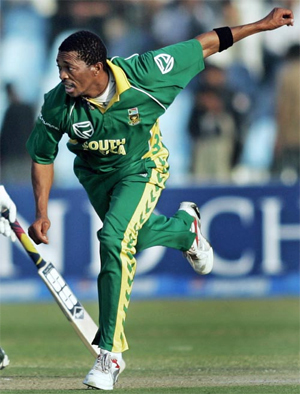 Makhaya Ntini was born on July 6, 1977, in Mdingi, nr King William’s Town, Cape Province, a right arm fast bowler and right hand bowler. The right hander had the fantasy to play cricket ever since he was in the school and gradually developed in to an accurate bowler after maturing domestic cricket. The athletic performer remained eager of taking wickets while making plans accordingly for the facing batsmen. The 34-year-old made his debut against Sri Lanka on March 19, 1998, at Cape Town and claimed two wickets in the match which was won by the home side by 70 runs. Ntini has played 101 matches, clinched 390 wickets at an average of 28.82, the best of 7 for 37 runs in an innings and 13 for 132 in a match. Ian Terence Botham was born on November 24, 1955, in Oldfield, Heswall, Cheshire, a right arm medium fast bowler and right hand bowler. He was one of the most prominent attacking all rounder of his age and won quite a few matches for England single handed. Botham was one of the most exceptional cricketers who was being covered in the media and highlighted time and again. His swing bowling earned him a lot of wickets and he relied on his line and length all the times. The 56-year-old entered in to international arena in the match against their arch rival Australia on July 28, 1977, at Nottingham. He made an instant impact by grabbing five wickets in the first innings of the encounter which they won by seven wickets. 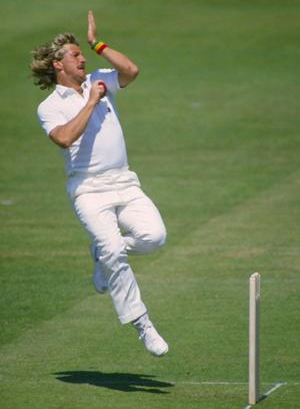 Botham has played 102 matches, secured 383 wickets averaging 28.40 runs per wicket with the best of 8 for 34 in an innings and 13 for 106 in a match. Malcolm Denzil Marshall was born on April 18, 1958, in Bridgetown, Barbados, a right arm fast bowler and right hand batsman. He was one of the best speedster of his time who left this world at the age of nearly 42 years. Marshall used to have a smooth bowling style and was master of the art of fast bowling with the qualities of delivering lethal Yorkers, in dippers, speed and swing. He made his debut against India on December 15, 1978, at Bangalore, and claimed a wicket in the drawn match. The great Marshall has played 81 matches and bagged 376 wickets at a splendid average of 20.94 runs per wicket with the best of 7 for 22 in an innings and 11 for 89 in a match. Thanks for the info but I would you to explore more esoteric bowling statistics. i.e. has there been a cricket match in which every participating player except the two wicketkeepers took a wicket? Ntini over Waqar Younis? how? That is a somewhat bland list, with the odd exception.